There’s lots of information out there on the kitchen triangle. 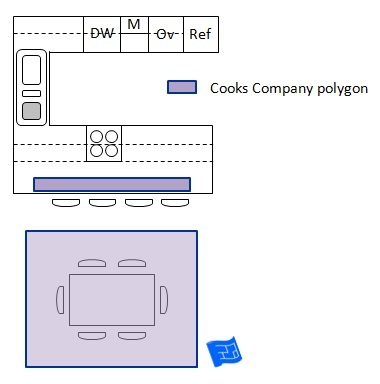 On this page I explain why these days it’s more like a series of kitchen polygons (a shape with any number of corners) and I explain the process you need to follow to design your kitchen polygons. Before you start on this page, have a look at the how to design a kitchen page which starts you off on taking measurements for your kitchen and deciding on the shape. Then come back here. 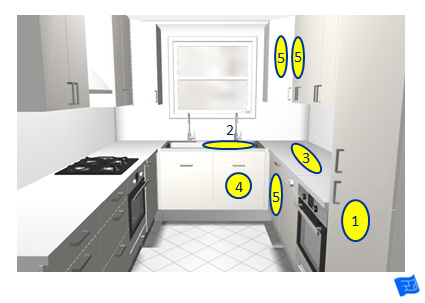 This page forms part of the kitchen design layout series and it forms the information for step 6 of the how to design a kitchen process. Where did the kitchen triangle come from? 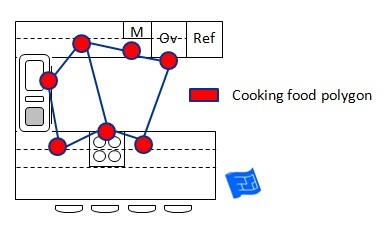 The kitchen triangle is a tool to decide where to locate the range, refrigerator and sink, in an effort to get an efficient arrangement based around the activities of cooking, preparation and cleaning. It’s a concept that was introduced in the 1940s for the housewife cooking on her own in the kitchen scenario with only a few appliances available. How times have changed. 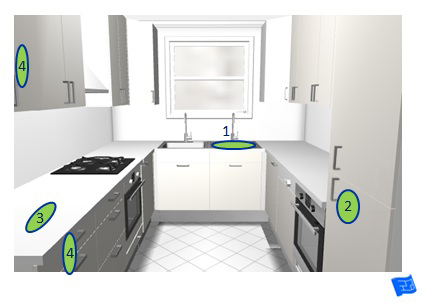 The way we live in and use our kitchens has moved on (and not to mention the appliances on offer today) so we need to integrate the kitchen triangle into a new model for designing our kitchens. The kitchen triangle is still valid – after all we still have a cooking surface, sink and refrigerator but we also have ovens separated from the cooking surface, dishwashers, recycling, more appliances, maybe people cooking together and people keeping us company in the kitchen. 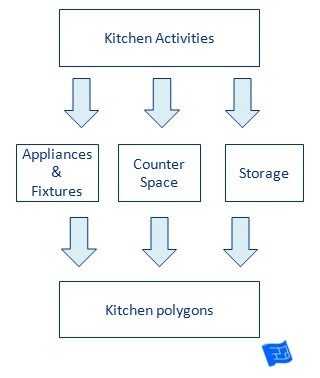 So while the kitchen triangle is a starting point – after we examine all the different activities and the appliances, storage and counter space they need, the kitchen triangle soon expands into something bigger – a bunch of kitchen polygons. 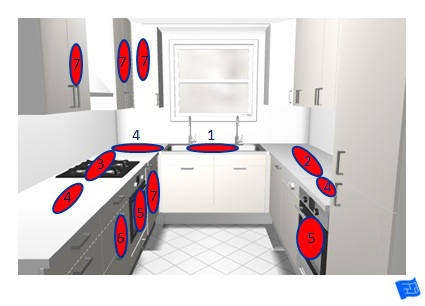 The aim of kitchen polygons is to provide a tool to plan the location of all the appliances, work zones and general storage areas required for activities that you and your household undertakes with respect to food. And because each household does things in its own way the polygons can be any shape and have any number of points – a kitchen design just for you. Each activity that is carried out in the kitchen has associated appliances, counter space and storage requirements. Now we start on the design process. Remember that design processes are iterative and you might go through this process several times before finalizing a design. You change one thing – it impacts on another. Once you’ve been through it a few times to develop a few alternative designs, test them by imagining using your kitchen in your head. Imagine yourself using your kitchen in each little detail – is the kitchen working in the way you need it to? If you're following the how to design a kitchen process you'll already have decided on the shape of your kitchen so now it's time to decide where to put the appliances and fixtures. 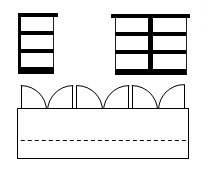 This page uses a U-shaped kitchen as an example. Step 1 - What do I do in my kitchen? Step 2 - What do I need for what I do in my kitchen? To work out what you need for everything you get up to in your kitchen just imagine doing each activity in your head. What do you use and where do you use it? So if you imagine preparing your regular meals for cooking (just the prep step - cooking is the next activity) you might come up with a 'what I need' list something like this. 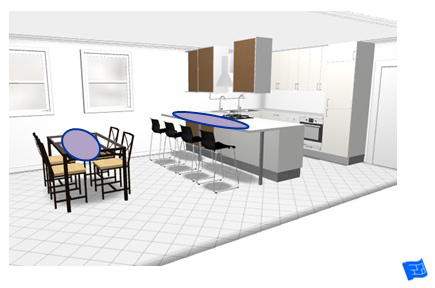 So let’s go ahead and set up the kitchen polygon for food preparation. Place the refrigerator in an area of the kitchen that’s accessible without walking through the main cooking area – usually towards the end of a run of units (keep in mind refrigerator door clearance requirements in kitchen dimensions). That way other members of the household can use the refrigerator without disrupting the cooking activity. In addition if it’s a tall unit it’s logical to have it at the end of a run of units. Place the sink. Check the kitchen dimensions page for guidelines. Place the counter space area for grocery set down, chopping, organizing and counter top appliances. 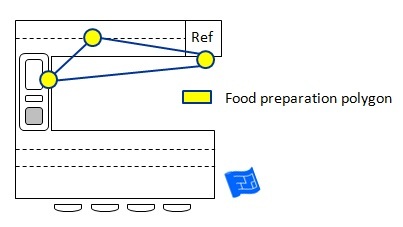 Place the storage areas related to food preparation around the preparation area. Place the freezer if it isn’t part of the refrigerator. Since trips to the freezer are less frequent this can be in another location (eg pantry or utility room) if it makes sense. 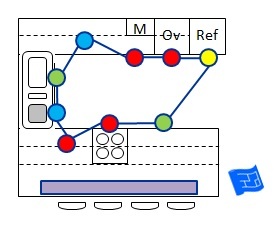 Locate any ‘extras’ such as radio and TV. I guess in this case we do have a kitchen triangle! What do I need for cooking food? The sink is already in position. The food preparation counter space is already in position. Place the cooking surface. 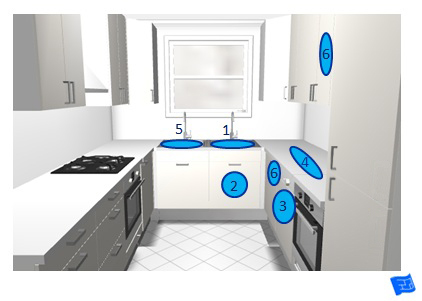 Check the kitchen dimensions page for guidelines. Make sure the cooking surface is as sheltered from circulation within the kitchen as much as possible. Accidents happen when the person cooking turns round with a hot pan straight into someone walking through or into the kitchen. I find that I like to be able to move from the cooking surface to the sink in a right handed direction because I’m right handed. 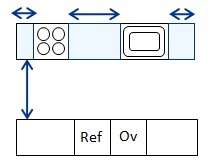 Identify the counter space available for setting down hot pans and plating food. Locate the oven. Options are with the range, beneath the cooking surface, beneath the counter top, in three quarter or full height cabinet. Locate the microwave. The microwave can be built in or free standing. Options are beneath counter top, at the bottom of a wall cabinet, above the cooking surface, in the pantry, on the counter top. 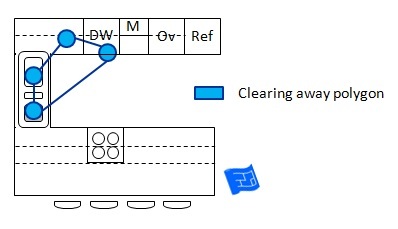 Locate the storage to do with cooking food around the main cooking area. 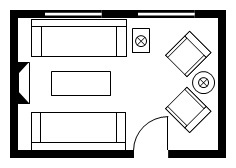 It may seem strange to consider clearing away before the activities of setting the table and eating but the location of the table ware will depend on the location of the sink and the dishwasher as well as the table and I like to deal with sorting out the location of all the appliances as soon as possible in the piece. The waste storage is already in position. Locate the dishwasher near the sink. See the kitchen dimensions page for guidelines. Identify the space used for dirty dishes. Identify the storage space for glassware, cutlery and crockery to make putting it away once it’s been cleaned the easiest. This should be the driver for the location of cutlery and crockery. Everything that’s required for setting the table is already in position, except perhaps for a few table accoutrements such as table linens which should be stored close by the table. Otherwise it’s just a question of checking that the location of glasses, cutlery and crockery isn’t located too far from the table. Just have a think about the view that you will have of the kitchen from your eating areas. Are you happy with it or does it need improvement. For example do you want to incorporate a sliding door or shutters to hide the kitchen when you’re eating. Self service is all about those quick cups of coffee and little snacks. The refrigerator is already in position. Locate the self service area. This may well be a space that’s already allocated that can do double duty. 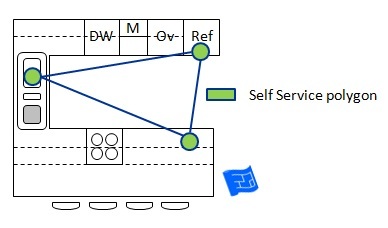 Locate the storage required for self service tasks. Sometimes it's nice to have someone keep you company while you're preparing the food. It's great to have people there but you don't want them in your way. Here guests can perch on the counter top or take a seat at the kitchen table. Maybe they'll even help peel the vegetables! I hope I've managed to convince you that you need to think in terms of all the different activities that go on in your kitchen and appreciate that they all have several touch points in the kitchen layout. It's not just a kitchen triangle.